A few years ago solving an interface problem was just a matter of applying thermal grease. Things are much more complicated today. Not at least because the heat fluxes are increasing. The large flora of commercially available interface materials is a good illustration of that. The interface problem has many facets and they can not all be brought up in this article. Fortunately, there are experts to consult. The purpose of this article is therefore not to be complete, nor profound. It is rather to present an overview that hopefully could help some readers to become better discussion partners when consulting the real experts. There are no flat surfaces. Pushing two surfaces together is like placing Switzerland on top of Austria. Cavities can not be avoided. With this image in mind it is apparent that surface roughness and surface flatness are important parameters. Another important parameter is the pressure. High pressures cause larger micro deformations than low pressures, Fig.1. It should be noted that the scale on the Y-axis is exaggerated. It is somewhat deceiving but it is the conventional way to image surface roughness. A more proportional representation would look something like waves on a see surface swept by a breeze. Low pressure contacts are highly dependent of the fill material. For dry contacts it is air. For wet contacts it is usually a high viscosity fluid, for example grease. Exclusively looking at the thermal conductivity, there is a factor 10 to gain by switching from air to a fluid. For thermally enhanced fillers, such as thermal grease, it is even higher. In practise, the gains are more modest, see: Thermal interface materials. There are several reasons. The fill material has a thickness in itself that adds a thermal resistance and causes a loss of metal-to-metal contacts, (enhanced fill materials are often loaded with high conductive grains, which limits the minimum thickness). There is also a surface wetting problem, see below. In this context it could be remained that air sometimes can behave as a Knudsen gas. This appears when the mean free path, (molecular travelling length between collisions, ~60 nm at 1 atm), is of the same order as the size of the enclosing vessel. In practical terms, when the pressures is low or when the wall spacing is small. Interface cavities can actually be so tiny that this impact must be considered. The result is a decreased thermal conductivity. High pressure contacts are mainly dependent of the metal-to-metal contacts. Each contact surfaces can be looked at as a bottleneck, (the flow lines form a bottleneck shape). 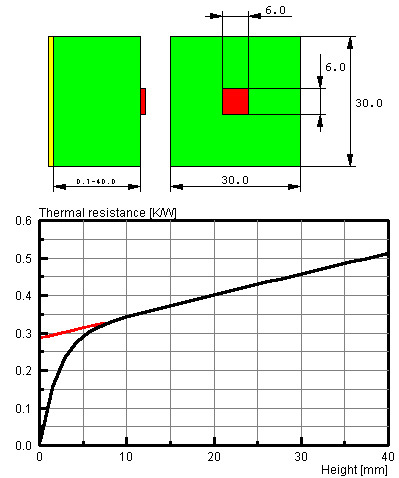 Fig.2 shows a method to detect that particular thermal resistance. Several parameters are important here. Surface roughness is one and the softness of the material is another. Insightful research has reviled the physics of this case. With access to all parameters involved it nowadays seems possible to predict high pressure contact resistance reasonably well. To get a perspective it could be of interest to present some numbers. Suppose a dry low pressure contact between two polished 30×30 mm aluminium blocks has been measured to 0.3 K/W. Only considering air conduction this corresponds to a ~7um air layer. The roughness for a polished surface is however of the order ~1um, which indicates that it is the flatness of the surfaces and not the roughness that is the main parameter in this case, (a flatness that is ~10 times the roughness is realistic for “large” surfaces of the type discussed). Considering the stochastic character of flatness, it is apparent that no conclusions can be based on one lab test only. The matter must be dealt with by statistical means. Taking the totally opposite approach and assuming that all heat is conducted by the metal, a bottle neck analyses results in 4% metal-to-metal surface contact. It is not at all realistic for this case because it would involve a force of the order 10kN, (~1 metric ton). Forces of that order can hardly be created with anything else than powerful bolt attachments. A much discussed problem is that most interface materials do not fill the cavities completely. As a result there are interfaces within the interface. The mathematical formulation is shown in Fig.3. A fundamental conclusion is that the thermal resistance for an interface not only depends on the properties of the fill material but also on the surface structure. There is nevertheless one liquid that is well known for its good wetting properties, silicon oil. Even the tiniest drop on a surface extends to a palm sized stain within minutes. Silicon oil is therefore an excellent cavity filler. The drawback is that it also tends to creep out on adjacent surfaces. As a consequence, there is a dry out risk. A much more dramatic risk however, is that silicon oil forms silicon oxide in presence of sparks. It is devastating for electrical contacts such as in relays. Silicon oil was therefore banned in the telecom industry for many years. Mechanical relays are however successively being replaced by semi conductors, so things may have changed. Fig.4: The active interface surface is rarely the package top surface. Just as there are no flat surfaces there are no isothermal surfaces either. It is a question of degree. Almost isothermal surfaces can be created in the lab but they are rare in applications. It might for example be tempting to look at the top of a component as an isothermal surface. This is seldom the case. It all depends on what is underneath, Fig.4. For all applications involving components with heat sinks it is therefore a good rule to have a look. The 45 degree rule is often handy for a first estimate of the active contact surface. Given the proportions in Fig.4 it is only ~25 % of the total top surface. All applications are not that bad but large errors can evidently occur if this impact is neglected. It should nevertheless be remained that the 45 degree rule is an approximation intended for plates with one isothermal side. This is not quite the case for the example above but the rule is conservative. It works relatively well when the thermal resistance in the interface is of the same order as the thermal resistance in the component top. In the example above the corresponding range was ~2 and the error when applying the rule ~20%. The error is larger for more extreme cases, for example components with highly conductive tops. The 45 degree rule is nevertheless recommended for over view purposes. That is, as a signal if the matter needs to be looked into more closely or not. Fig.5 shows another non-isothermal interface problem. It is common in radio base stations. Amplifier transistors are in this case screw fitted on a large heat sink. The heat fluxes are high, which induces large temperature gradients. There is a thermal expansion coefficient mismatch and the pressure is much higher below the screws than elsewhere. The result of it all is that the transistor foot forms a slight bow. It is needless to say that this effect is problematic. Fig.6 shows how bad the situation can be. Fig.6: Example of temperature profile below a transistor such as in Fig.5. What is a thermal contact resistance? The general definition of a thermal resistance is very simple. It is the ratio of a temperature difference and a heat flow. This is not a problem for well conditioned laboratory cases but as shown above, it is often problematic in applications. The main dilemma is the temperature difference definition. It is easy to make all kinds of definitions, (a definition is by definition always correct), but it is very difficult to make them purposeful. The truth of the matter is that the thermal contact resistance concept rarely can be used for applications. An alternative approach is the sandwich method, Fig.7. It consists of including parts of the surrounding structures in a thermal resistance definition. For a package it typically results in a Rj-s value, (junction-to-heat sink). The basic idea is to push the temperature definitions away form the contact surface, where the temperature gradients are high, onto surfaces with more uniform temperatures. Such surfaces do not exist, so there will still be uncertainties but on a much lower level. This method is good for hands on measurements. The drawback is that the constituting thermal resistances not can be separated. If something changes, for example the fill material, new measurements have to be made. Another approach is finite element calculations. The drawback in this case is the uncertainties. The thickness and the wetting properties of the fill material are difficult to determine. The result is nevertheless almost always a very good overview that is helpful for understanding the problems involved. It can be concluded that not knowing what a thermal contact resistance is, that is, not knowing how to define it purposefully, it can neither be determined. There are works around but none of them is as clear cut as a first superficial look at the problem could suggest.